« Couples Retreat – They’re so money! Yesterday I was at the Public Enemies press conference in London. It was fantastic. It’s not everyday you get a chance to listen to Michael Mann, Marion Cotillard and Johnny Depp talk about their films. I was also lucky enough to ask a question of both Marion and Johnny. Who would have thought it! They each came out separately and we had about 20 minutes to ask them questions. 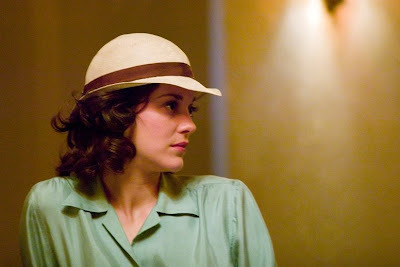 I will start of with Oscar winner, Marion Cotillard (La Vie en Rose) and post Michael and Johnny’s later today. Before each one we were asked to keep our questions relevant to the film. A bit of a shame as I wanted to ask Marion about her work on Christopher Nolan’s Inception. Oh well. Marion looked lovely in a long green dress. All of them came across as happy, confident and they all seemed to enjoy the questions. I managed to get a photo of them all, but the one for Marion was very blurred so I couldn’t use it. Why did you say yes to Public Enemies? Because I’m a great fan of Michael Mann and when he asked me to star I couldn’t believe it and I was very happy. I met him and read this beautiful script. How was it doing the American accent and how did you prepare for that? It was a technical issue and it was very hard. When I started I thought it was not possible at all, but I really tried to do my best. Fortunately Billie was half French, although she’s not supposed to have French accent. It’s very technical. You really have to work and work. Practice and using your whole face, jaw, tongue, body in a total different way. It was very interesting. There were hours and hour in front of a mirror with my vocal coach because you don’t think how you speak. There were so many men in this film. How did you feel being on set in one of the few female roles? Did you feel excluded? No, absolutely not. Michael Mann has a great respect for women. He’s surrounded by women in his life and I think that is why the women in his movies are very strong. They really have strong personalities and they have a very special place in all his movies so I felt really welcome. Michael asked you to meet some gangster’s wives and girlfriends. How was that? They were actually convicts wives some of them were not with gangsters. They were all so generous to share their stories, the very painful experiences they had. We spent a few hours together and it was very emotional because they were very emotional going through the full story of their life. I could see and feel their pain and fears because you don’t know what’s going to happen the next day. It helped me a lot. You gather some emotions and feeling. It creates your character. You said you didn’t know anything about Dillinger as all so you must have done a lot of research to find out about him. He’s an American folk hero. Is he known in France at all? I’m not very sure. I think that my generation doesn’t know Dillinger and yeah I didn’t know anything about him. I didn’t even know his name. The first thing I read about him was the script and the book, Public Enemies. I didn’t do a lot of research about him. My research was more about the period, the American history, and the Indian history because Billie Frechette is half [Menominee] Indian. I really wanted to know about American culture and Indian culture. I knew about the era I learnt at school about the crisis in the Thirties, but I didn’t know that much about American history. What I read about Dillinger was just the script and the book. I watched a lot of pictures of him, but my research was on the Thirties and the American culture. I never talked about Dillinger with anyone. He may be well known with French people. Was the experience of working with Michael Mann more than you anticipated? When I met him, right away, when I came in his office I felt that there was a connection between the two of us. I don’t know how to explain it. I really love him as a person and a director. I wanted to be perfect for him. I wanted to give the best of my best. I don’t know if I did. He was inspirational. Then it was my turn. I was the gentleman in the third row! What was it like filming the interrogation scene? How much preparation did you have to do? The difficulty of the scene was that when you have a very emotional violent scene to do you think of the technique and I had to keep the mid-western accent. It was very difficult, as I had to let it go but at the same time not think about. I love extreme scenes. I would say that after this kind of scene I feel empty but also fulfilled. I think it may feel like when you do sports and you have a competition like the 100m. After that you feel tired and empty but fulfilled because you did something that was intense. I really love it. It’s not difficult but it is technical. I didn’t work with him too closely. When we were filming everything was in the Thirties. I think there is something that stays with you while you film. For example if you have an accent you keep it between the scenes, as it is hard to get there. Sometimes it is better to stay there even when you are not shooting, because if you totally get out of it to come back is the same journey. Before I did La Vie en Rose I thought it was dangerous to stay in character and more than that I thought it was kind of ridiculous. I had a judgement because I didn’t know that it’s really hard to go back there. After that my opinion, it was not even an opinion it was a stupid judgement because I didn’t know what I was talking about. Now I know I didn’t force myself to stay in character. It was easy. I couldn’t stop between takes because it was so much work to get there. I really do understand this now. Thank to Marek at Way to Blue for inviting me and for MPC for the screening. This entry was posted on July 1, 2009 at 11:17 am	and is filed under Uncategorized. Tagged: Christopher nolan, Inception, Johnny Depp, LFF, Marion Cotillard, Michael Mann, news, press conference, Public Enemies. You can follow any responses to this entry through the RSS 2.0 feed. You can leave a response, or trackback from your own site.